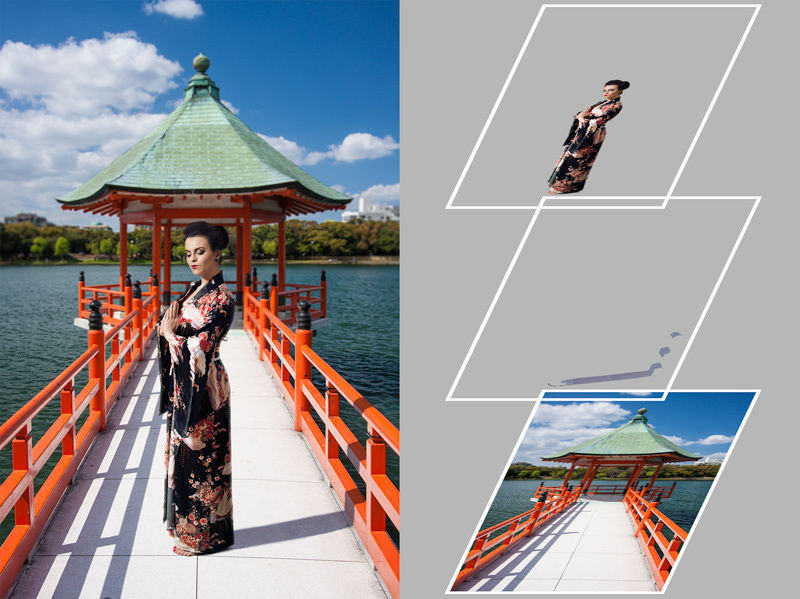 Version X of Zoner Photo Studio offers a key new feature: work with layers. ZPS has had a simplified sort of layers for a long time now. For many operations, past versions of ZPS automatically created a temporary new layer on top of the original layer. This temporary layer was then altered by the operation. But at the end of the operation, this layer was merged with the current picture, and was lost. The latest version features support for multiple layers that can be adjusted however you need and that stay available and independent of each other forever. Let’s start with one common photo editing job—the collage, or photo montage. Do it with layers, and you can have each element on its own layer. For example the landscape on the background layer, the sky on another layer, and perhaps a castle on a hill on a third layer. Or something like the composition below: a background, a model, and her shadow. Three layers that, taken together, form one image. This picture is a natural for using layers. But layers are also useful for other operations. 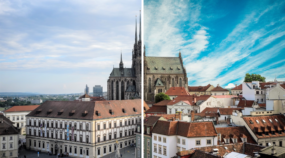 In our example, many experienced retouchers would create even more layers; they would draw more lights and shadows onto them, or would use them for color corrections. 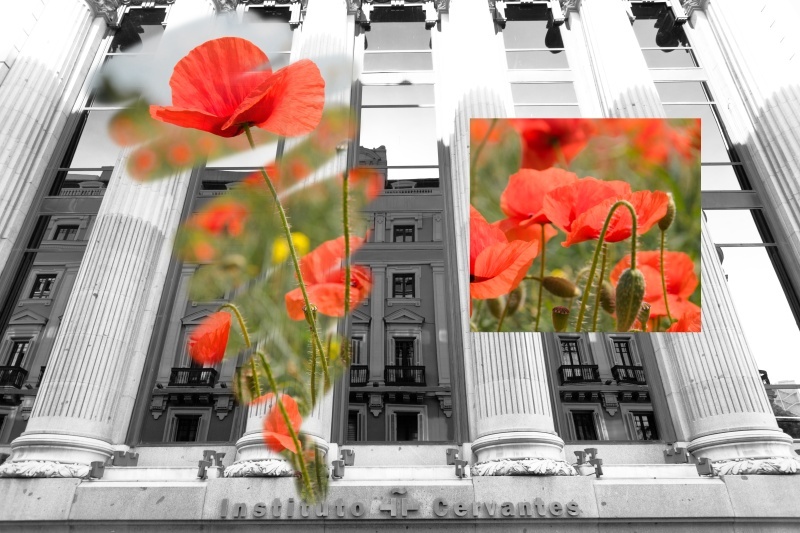 Often layers can also be useful for ordinary edits to a single, non-montage picture. They’re especially handy for edits where you want to be able to take back any part of your work at any time, or for various experiments with colors or exposure. All the most common layer-related functions are in the Layers group within the Editor’s right-hand side panel. This is the bottom-most group within the panel. The Layers group, with three layers. Delete Layer—use this to remove a layer you no longer need. Duplicate Layer—use this e.g. when you plan to try out various color variations and you’re not sure you’ll like them. Rename Layer—use this to make sure you never get lost in your layer list. 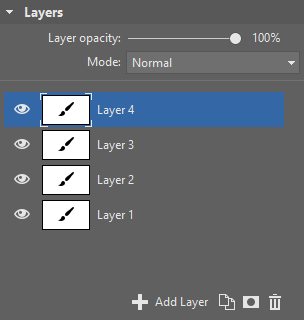 Instead of names like “Layer 1” you can have names like “Background” or “” To rename layers more quickly, double-click their names. The order of layers is very important, since your upper layers cover the layers below them. So you may need to change their order sometimes. To reorder layers, drag and drop them. Each layer can be visible or hidden; to show/hide layers, click the eye icon next to the layer icon. To reduce your layer count without actually deleting layers, use the Merge Down command (merges the existing layer with the one below it) or Merge Visible, or Merge Layers. The last two of these functions merge everything on the screen into a single layer. But Merge Visible leaves hidden layers untouched and usable for further editing, while Merge Layers removes them completely. To change a layer’s overall transparency, use the Layer opacity slider. You can also adjust how a layer affects the layers below it—it doesn’t have to cover them; it can alter them instead. For this adjustment, use Mode. The downside is that you can’t directly change this kind of layer with complex effects such as blurring. There’s a solution, though. 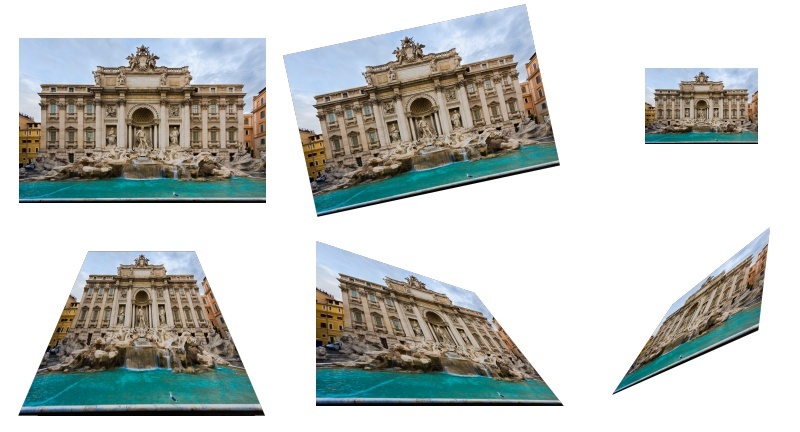 Convert the layer into a bitmap (photo-style) image. To do this, use the Rasterize item in the right-click menu for the given layer. Keep in mind that after you do this, you will no longer be able to edit the text directly. So you should think twice before using this command. Layer masking is absolutely key for complex work with layers. You can give a mask to a layer at any time. This mask then defines which parts of the layer are visible, which are translucent, and which are completely transparent (invisible). In other words, the layer itself is still completely untouched, but the mask makes it see-through where you want, when you want. If you ever later decide to make the layer opaque again—restoring the original picture—you can do so quickly. So one great thing about a mask is that it will never destroy your work. 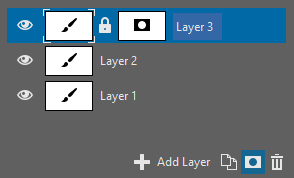 To mask a layer, click its Mask button in the Layers group. Then just choose whether the mask should start out covering everything, or showing everything on the layer. The top layer has been given a mask using the highlighted button at the bottom. Even though you can’t see the mask in the final picture—only the effect of the mask—you can still draw on it, fill in selected areas, and use all the usual filters, such as curves or blurring. Just click a layer’s mask in the Layers group. This makes a frame appear around that mask, and everything you do will start affecting that mask. You can edit either the actual picture on a layer (the top image) or the layer’s mask (bottom). To draw on or erase the mask, use the Paintbrush tool and then draw in white, black, or gray. You can draw any shape you like onto the mask easily. Likewise you can make selections within the mask and, for example, fill them with a single color. An image with two layers. The top layer was partially masked. The mask was set up using the brush (left) and a rectangular selection filled with white color (right). 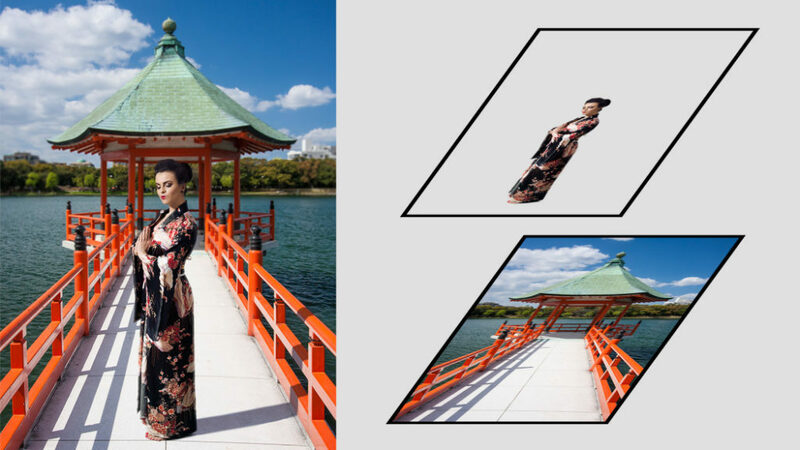 You can freely move and rotate each layer in your picture. If a layer only contains one object, then that’s like moving and rotating that object. And that’s in addition to stretching, shrinking, and perspective transformations (in the Move and Transform tools—to reach these tools, click their icon in the right panel or press the V key). You can also adapt an object for use against some completely different background. But be careful; during every transformation, the pixels in a layer are recalculated, and so too many transformations can mean a decline in image quality. 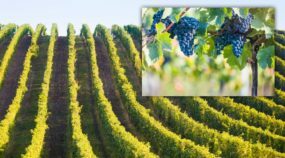 Above all, after any drastic shrinking of the image on a layer, a lot of its original pixels will be missing, and stretching the layer back out later won’t restore them. A single picture with six layers, each with a different transformation. Once you’ve added a mask to a layer, that layer gains a “lock” icon in the layer list, and that icon relates to transformations. To lock the mask or to unlock it (to turn the lock icon gray), click the lock icon. With a locked mask, all transformations affect both the layer and its mask. With an unlocked mask, you can transform just the picture on the layer, or just its mask, independently. Most often you’ll want a locked mask, and so the lock is turned on by default. But sometimes you’ll want to turn it off. Locked vs. unlocked layer mask. The following workflow is helpful for just about every edit: first duplicate an existing layer, and then work on this duplicate layer. You can then hide this copy at any time to see the difference between your original and your edited version. If you don’t like the new version, then just erase the top layer. If the effect is too drastic, then you can make the new layer translucent using the Opacity slider, or even add a mask to it and darken certain areas, thereby removing your edits from those areas. 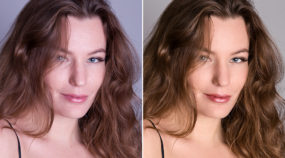 So you can, for example, dramatically add contrast throughout most of a picture, while using the mask to avoid sensitive areas such as the face. However, duplicating a layer will not always give you a copy of the whole picture. If the picture is made up of several layers used in complicated ways, then you’ll only get a copy of one of those layers. What you can do instead is use Select All (via the menu or the Ctrl+A shortcut) and then use the new function for copying the result of merging all layers to the Clipboard (Ctrl+Shift+C). Then just paste your results (Ctrl+V) to get a new layer containing the whole picture. It will be the top layer, covering every layer below it. Layers let you make complex edits to pictures, and yet they’re not complicated to use. In this article we’ve covered practically all the basics. You can work from these basics and combine them to compose some very interesting creations. I wish you happy experimenting!